Home > Shop By Brand > McKee's 37 Waxes, Compounds, Coatings > McKee's 37 Tire & Rubber Rejuvenator > McKee's 37 Tire & Rubber Rejuvenator 128 oz. Introducing the world's best tire cleaner! McKee's 37 Tire & Rubber Rejuvenator is the first component of a two-part tire protection system. This intense cleaner removes all traces of previously applied tire shine sprays, gels, protectants, and browning, leaving your tires 100% clean and ready to be coated with McKee's 37 Tire Coating. STOP CLEANING YOUR TIRES WITH CAUSTIC ALL PURPOSE CLEANERS! These high-octane, inexpensive cleaners actually do more harm than good. The issue with most all purpose cleaners is that they're formulated to meet a certain price point, and in order to achieve that inexpensive price point, caustic ingredients are often found in these products. These caustic detergents are harmful to you AND your tires! You see, tires contain antiozonants, rubber conditioners, and UV absorbers that help keep the tire flexible. The wrong cleaner will actually cause the antiozonants, rubber conditioners, and UV absorbers to leach out of the tire, resulting in browning, discoloration and cracking of the tire. McKee's 37 Tire & Rubber Rejuvenator is non-caustic, non-acidic, and it will not harm your tires! It's common knowledge among professional detailers and car care enthusiasts that a tire gel or tire shine spray will last considerably longer if the tire is properly cleaned first. By completely removing previously applied dressings and protectants, you have a clean base for the new tire shine to adhere to. This greatly extends the durability and increases the look of your tire shine of choice. McKee's 37 Tire & Rubber Rejuvenator is safe for use on all tires. We recommend spraying the wheel with water first, just to ensure any unwanted overspray is easy to remove. McKee's 37 Tire & Rubber Rejuvenator is the first step in prepping your tires for application of McKee's 37 Tire Coating, an acrylic-based resin that forms a flexible, chemical-resistant coating on your tires. If you plan on coating your tires with McKee's 37 Tire Coating, you MUST use McKee's 37 Tire & Rubber Rejuvenator first, or else the coating will not properly adhere. Wet wheels, not tires, prior to application. 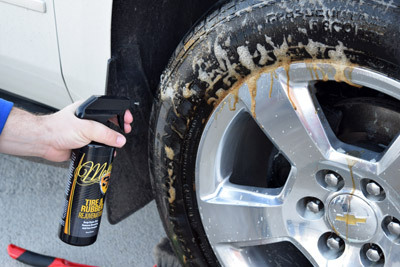 Spray a liberal amount of McKee's 37 Tire & Rubber Rejuvenator directly onto DRY tire and allow to dwell for 1-2 minutes. Scrub using a stiff-bristled brush; wet bristles often. 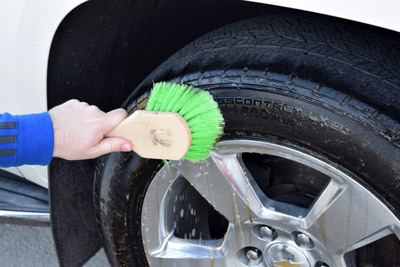 We recommend using the Low Profile Tire Brush because it's stiff and easy to hold on to. Thoroughly scrub the tire until all browning is removed. Tires are completely cleaned when white foam is produced as you scrub. 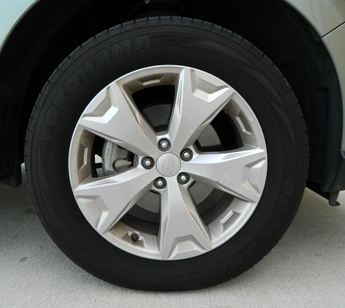 Thoroughly rinse wheels and tires, ensuring all traces of the cleaner are removed. 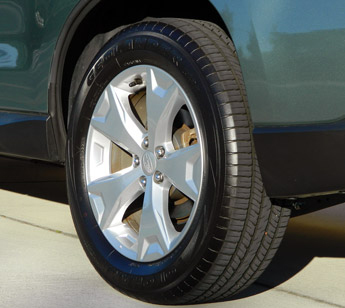 Allow tires to dry and then apply McKee's 37 Tire Coating. Spending my life in the tire business I don't like to use APC's or Degreasers on tires. Some of the chemicals are bad for the rubber. Spray this product on and watch the brown start to run off. Scrub them with a brush, rinse, and have a nice clean tire. The rubber actually looks much better than if you use those other cleaners. Hey guys bought this with the wheel coating, this stuff is the best tire cleaner period. Buy this it works, you will need a lot a 16 oz bottle will just do four tires. It is a bit pricey but itâ€™s worth it. I have used Westleys Bleche White for about 45 years and this product does just as good a job without the almost toxic fumes of Westleys, McKee's still has an odor similar to Westley's just not as strong and choking. A couple applications and scrubs and all of the brown from my tires is removed and ready for McKee's 37 Tire dressing. I Have never used on white letters or sidewalls just black tires, so not sure how it cleans white. Great product. Did a very good job cleaning my tires. This is the best tire cleaner/rejuvenator I have ever used. I cleaned my tires with a another tire cleaner, and when the tires dried, they had a brown tint on the sidewalls. After cleaning the tires 3 times, they were still dirty. Immediately following, I tried the McKee's Tire and Rubber Rejuvenator. As soon as I sprayed the cleaner on the tire sidewalls, the brown hue liquified and began running off the tires, even before I had a chance to to scrub the sidewalls with the tire brush. After cleaning the tires once with McKee's, I sprayed the tires again to clean them. This time, the foam remained clean and white, indicating the brown residue had been removed during the first cleaning, and the tires were clean. Great Product. Does not bleach or dry out the rubber like some products. ProsSurprisingly cleaned the tires the first time.